Obtaining autocephalous status for the Ukrainian Orthodox Church has become an integral part of Kiev’s current policies aimed at driving a wedge between the Ukrainian and Russian peoples, former Ukrainian Prime Minister Nikolai Azarov told Izvestia. "All that fits into the policy of breaking all ties with Russia - cultural, economic and religious ones. 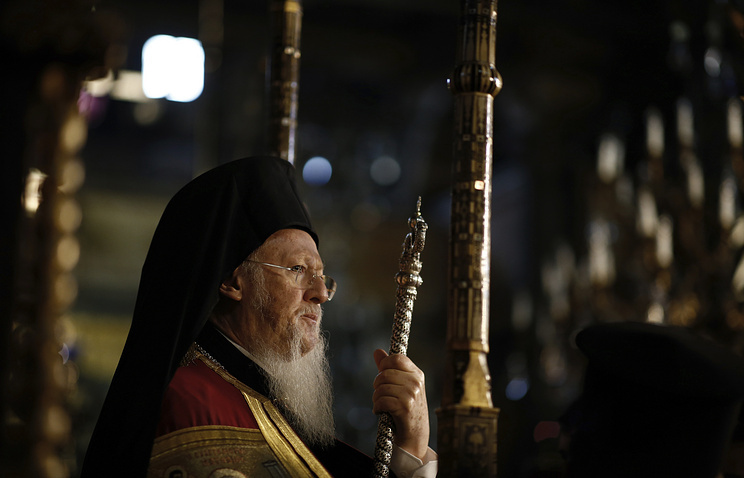 It is clear now that the US has exerted pressure on [Ecumenical Patriarch] Bartholomew [of Constantinople]. Perhaps, we have paid too much attention to the Ecumenical Patriarch who has not been ‘ecumenical’ over the past few centuries. The city of Constantinople no longer exists. All that’s left is Phanar (a neighborhood in Istanbul where the patriarch’s residence is located), while the patriarch himself is a Turkish subject," Azarov pointed out. In his view, President Pyotr Poroshenko seeks to secure additional voters’ support in the run-up to the presidential election scheduled for March 2019. According to Azarov, the decisions by the Constantinople Patriarchate will have disastrous consequences for Ukraine domestically and for the centuries-long ties between the two peoples. "Ukraine’s Security Service (SBU) is already collaborating with the clergy and local officials, and extremists will join up later," he warned. "During the transitional period, until the Tomos of Autocephaly is granted, it is important for Poroshenko to say that everything will be peaceful. However, this scenario is unlikely, since the decimation of the Ukrainian Orthodox Church of the Moscow Patriarchate is underway. Believers can only be broken by force. Therefore, the destruction of the Moscow Patriarchate in Ukraine cannot be peaceful by definition, and that’s what Poroshenko needs," Azarov explained. The current events should be viewed through the prism of an all-out war the West unleashed against Russia, Chairman of Russia’s State Duma (upper house of parliament) Committee for CIS Affairs Leonid Kalashnikov told the paper. "It is common knowledge that the Patriarchate of Constantinople is under the complete influence of the US. Religion is a tool in the global geopolitical struggle with the West for a place in the sun and another link in the chain of actions directed against us," the lawmaker stressed. Armenian Prime Minister Nikol Pashinyan has announced his resignation, stressing that it is a mere formality. This step will allow the Armenian authorities to hold early parliamentary elections without violating the Constitution, with forces loyal to Pashinyan being guaranteed victory, Kommersant writes. Ever since the triumph of this past April's "Velvet Revolution" in Armenia, Pashinyan’s supporters have seen his ‘technical’ resignation as the most convenient way of securing snap parliamentary elections. There are no fears that the parliament, which Pashinyan still does not control, will take advantage of an opportunity to elect another candidate, a lawmaker from Pashinyan’s Yelq bloc Alen Simonyan told the paper. "We have the full support of the Armenian people for all the moves that we are making now," he said. The anticipated snap elections are expected to be held on December 9 or 10. Aram Navasardyan, Director of the Armenian branch of the Gallup International Association, explained to Kommersant that the outcomes of the elections are unlikely to differ fundamentally from the elections to the Yerevan Council of Elders, in which the My Step bloc, which backs Pashinyan, garnered 81.05% of votes. As a result, Nikol Pashinyan and his supporters will have all the levers of power after the vote. Meanwhile, Konstantin Zatulin, First Deputy Chairman of the State Duma Committee for CIS Affairs, told the paper that Moscow was aware of the "efforts made by Pashinyan to prevent the election of another premier." "Of course, I view it as an element of manipulation, but these are the laws that were passed in Armenia at some point. All that will certainly be a cause for instability in the future, which is likely to be seen during the elections and after them," he predicted. Nezavisimaya Gazeta: Why are Islamist sleeper cells waking up in Syria? The implementation of the Russian-Turkish peace plan on the demilitarized zone in Syria’s Idlib province has raised some doubts, since Islamic State (IS, terror group, outlawed in Russia) sleeper cells are becoming active in the region again, Nezavisimaya Gazeta writes. In Deir ez-Zor, terrorists have regained full control over an area along the eastern bank of the Euphrates River. According to the Russian Reconciliation Center in Syria, that happened due to the inaction of pro-American units. According to the Russian military, terrorists have attacked a refugee camp in the Al-Bahr area, taking about 700 people hostage. According to media reports, the Hayat Tahrir al-Sham terror group (formerly Jabhat al-Nusra, both outlawed in Russia) vowed it would continue its jihad in Idlib and refused to surrender its weapons. Judging by the militants’ intentions, they are determined to carry on waging war against the Syrian army. "Turkey, which controls a sizeable part of Syria’s northern border and has the ability to sway opposition groups, including extremist ones, has definitely stood to gain from these developments. 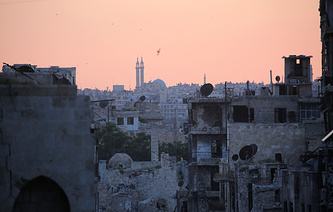 However, it is unclear what benefits Russia and Syria have gained from creating the Idlib de-escalation zone," military expert Colonel Shamil Gareev told Nezavisimaya Gazeta. According to the expert, in addition to Idlib and the northern districts of Latakia, Erdogan seeks to take control of the entire northern border with Turkey, which is currently controlled by the Kurds. "The United States is already providing assistance to Turkey here. Ankara suggested Moscow suspend the patrolling of Idlib. Instead, they are gearing up for launching the same process with the Americans," Gareev stressed. Erdogan’s defense chief Hulusi Akar earlier said Turkish troops, together with their US counterparts, would soon begin patrolling the territory near Manbij in Syria’s northeast. Furthermore, Turkey’s head of state announced plans for a military operation against Kurdish units in Syria’s northern border areas. Poland is forging ahead with a string of legal proceedings with the European Commission over decisions, which, Warsaw alleges, have been made in favor of Russia’s energy giant, Gazprom. This time, Poland’s state-controlled oil and gas company, PGNiG, is fighting the European Commission’s decision to end the antitrust case against Gazprom without a fine. According to Kommersant’s sources, its chances for success are very slim due to Gazprom’s significant concessions in that dispute. The compromise boiled down to the fact that the regulator had decided against imposing a fine on Gazprom, which could have reached 10 bln euro. In return, the Russian energy giant pledged to comply with certain market rules and roll back prices in contracts with the Baltic countries, Poland and Bulgaria to levels approaching that of hub prices in Western Europe. However, Warsaw was dissatisfied with this decision. Gazprom has declined to comment on the issue. Kommersant’s source in the company noted, "For us the issue is closed, in this case we are not a party to the proceedings." Meanwhile, the paper’s sources familiar with the situation believe that the Polish company is perfectly aware of its position’s weakness. However, the Polish gas conglomerate can try to use the litigation to pressure Gazprom as part of the gas price arbitration proceedings between the two companies. Gazprom, in compliance with its commitments to the European Commission, will eventually have to bring the prices for Poland in line with the price levels in Germany. However, the company has not done that for the time being, delaying the arbitration proceedings. 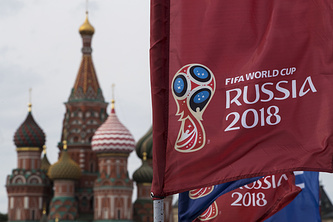 The Russia-hosted 2018 FIFA World Cup and the run-up to the event have brought in an extra 952 bln of rubles ($14.5 bln) to Russia’s national budget, which is an equivalent of about 1% of the GDP, Vedomosti writes citing data provided by the Russia 2018 Local Organizing Committee (LOC). That’s 10% more than planned. According to the LOC’s April forecast, the FIFA World Cup was expected to ensure an additional 867 bln rubles ($13.2 bln). During that period, Russia had earned more from foreign tourists, the Local Organizing Committee said. A total of 487,000 visitors from overseas came to the country to attend the 2018 World Cup. The transportation and social infrastructure built for the tournament will bring the GDP up to 210 bln rubles ($3.2 bln) annually within the next five years, the Committee said. The experience of previous tournaments shows that far from all countries use the infrastructure that had been built, the paper quotes Natalia Orlova, Chief Economist at Alfa-Bank, as saying. According to Orlova, many regions have become more accessible thanks to the new transportation and hotel infrastructure. However, that does not mean they will be more popular with tourists. Enhancing marketing is more likely to contribute to promoting tourism, Orlova noted. Currently the number of tourists is growing primarily thanks to surging amount of Asian visitors, she stressed, adding that the popularization of tourism is linked more to the country’s geopolitical position than the availability of infrastructure facilities.